Hoosier History Live! will be pre-empted on WICR-FM so the radio station can broadcast Yom Kippur services Sept. 14 from the Indianapolis Hebrew Congregation. Even though you won't be able to tune in and listen to us over the airwaves, as a special treat we will make available - on our website and by clicking on a link embedded in our e-newsletter - one of the most popular programs from our Hoosier History Live! archives. The featured program is a show in our rotating series about ethnic immigration to the Hoosier state. We have explored our German, Irish, Italian, Greek, Scottish, Brazilian and even our Sikh heritage in Indiana, among others, during our five-and-a-half years on the air. If you'd like to have a look at our rich archive of past weekly enewsletters, click here. 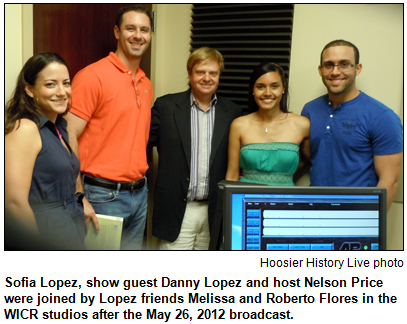 To explore Cuban immigration to Indiana, Nelson is joined in studio by Danny Lopez, who was executive director of the Indiana Commission on Hispanic/Latino Affairs when this show originally was broadcast on May 26, 2012. All four of Danny's grandparents left Cuba in 1960, fleeing political and economic upheavals. Since he shared intriguing details about our state's Cuban heritage on this show - including identifying Fort Wayne and South Bend as the cities that have had the most concentration of Cuban immigrants - Danny has a new job title, although he remains an administrator with state government. Since the election of Gov. Mike Pence, Danny has been special assistant to the governor. During our show, he notes that the number of Hoosier with Hispanic/Latino heritage has nearly doubled since the turn of the new century, climbing to 389,000, according to the 2010 U.S. Census. About 85 percent are of Mexican heritage. The next largest ethnic groups of Hispanic/Latino heritage in Indiana, according to Danny, are Puerto Ricans, followed by Cubans. Cuban-Americans here (there are 4,300 of them, Danny reports) differ from their counterparts from other Latin homelands in several ways. He attributes the concentrations of Cubans (for several generations) in South Bend and Fort Wayne to, respectively, the University of Notre Dame and to Catholic parishes in Fort Wayne that assisted Cuban families, including children during the early 1960s who were evacuated because of the Fidel Castro regime. In terms of the overall Hispanic/Latino population, the largest concentrations are in Indianapolis and in Lake County. Danny has been a Hoosier since 2008. He grew up in Miami and graduated from an all-male, Jesuit-run preparatory school there that had been attended by his ancestors in Havana. Danny's wife, Sofia, also is Cuban-American; her grandfather graduated from Notre Dame. Danny's paternal grandfather attended his alma mater, the Jesuit-run prep school, but it had a different setting then. 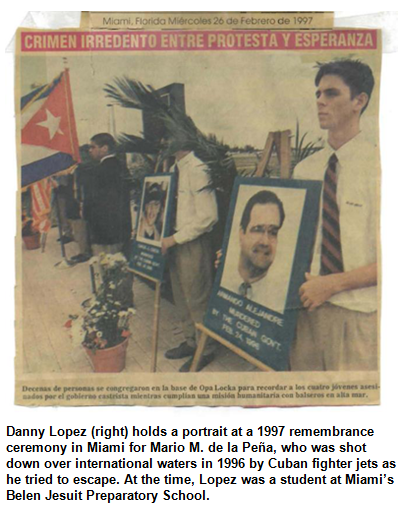 As Danny discusses during the show, the prep school was based in Havana, not Miami, during his grandfather's era. With increasing waves of Hispanic/Latino immigration to Indiana and other states, concerns have been expressed about "linguistically challenged" children in schools. In some immigrant households, as Danny notes, young children are the only English speakers among the family members. But Danny also emphasizes that a reverse effect has the potential for unnecessarily limiting the advancement and talents of Hispanic and Latino children. "We have concerns that many Hispanic families are not encouraging their kids to develop, or even keep, their fluency in Spanish," he said. "The parents want their children to assimilate so badly that they are discouraging their Spanish language usage. Obviously, though, fluency in Spanish will be a tremendous asset for professional opportunities later in life." Unlike surrounding Midwestern states that have experienced only slight population increases or, in the case of Michigan, even lost residents since the turn of the 21st century, Indiana’s population climbed 6.6 percent. According to an Indianapolis Star analysis of 2010 U.S. Census data, Hispanics accounted for 43 percent of the population increase in the Hoosier state. A video of an interview with guest Danny Lopez on Newsmakers from WNIN in Evansville, Ind., about Hispanic and Latino affairs. An article from the Miami Herald about "Operation Peter Pan" or "Pedro Pan." From 1960 to 1962, about 14,000 Cuban children were flown to Miami as refugees without their parents because their parents feared for their safety under Castro. 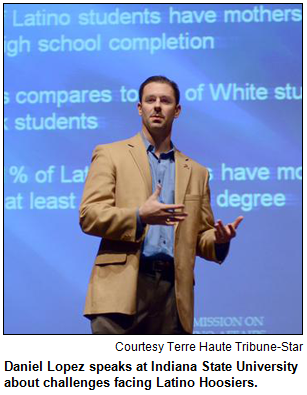 A report from the Kelley School of Business about Indiana's Latino population. A Youtube about the history of Operation Pedro Pan. Thanks to UIndy student Derrick Lowhorn for editing this podcast. Cuban-born Indy resident Ernesto Gonzalez steps up to talk about one of his personal passions, the Latin and salsa dance scene in Indy. An active dancer himself, Ernesto tells us about the Jazz Kitchen, the Red Room, and other hot spots around town on this online show. 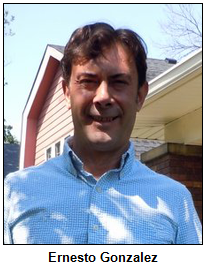 Ernesto came to Indy in 1980 as a 17-year-old, being sponsored by the Indiana Catholic Conference at 1400 N. Meridian St. in downtown Indianapolis. "I came as a political refugee, completely by myself, speaking no English, with only the clothes on my back," he says. Ernesto has worked in Indianapolis as a hair designer for 33 years. "America provides opportunities," he says. "I believe in hard work, and in reaping the rewards of hard work. I also believe that it is very important for everyone coming to this country to learn English." Ernesto's parents and three siblings still live in Cuba, and 16 years ago Ernesto sponsored one of his brothers in moving to Indianapolis. During the 1990s, a city in Indiana elected a Hispanic mayor, one of the first in the state. He won two terms in office as mayor of the Hoosier city, serving from 1996 to 2003. A Democrat, he is the son of Spanish immigrants and was just 35 years old when he first won election as mayor of the city, which has been gaining population for several years. During his second term in city hall - in 2002 - the mayor launched an unsuccessful campaign for Indiana secretary of state. 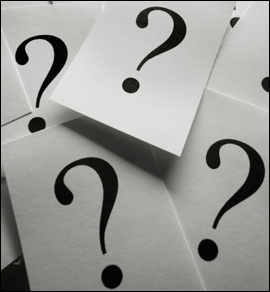 Question: Name the city in Indiana that had a two-term mayor of Hispanic heritage beginning in 1996. To win the prize, you must post your answer on the Hoosier History Live Facebook page. The first person to answer correctly will win passes for four to the Indiana Experience and a pair or tickets to the Eiteljorg Museum. The second person to answer correctly will receive passes for four to the Indiana Experience and a pair of tickets to the NCAA Hall of Champions. The winners must be willing to provide their U.S. postal addresses so that the prizes can be mailed. These prizes are courtesy of Visit Indy and the Indiana Historical Society. Please do not try to win if you have won any prize on WICR, or on our Facebook contests, within the last two months, so that others can have a chance. By the way, our Facebook winners last week were Wanda and Jane! Be sure to "like" us on Facebook if you haven't yet. And, we're also on Twitter at @hoosierhistlive. A big shout-out to our youthful and beautiful Tweeter, Allison DePrey Singleton; she is a former show guest who told us that we needed to be on Twitter! 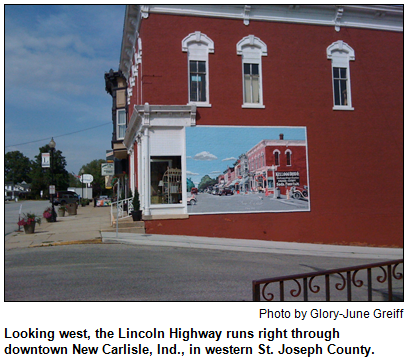 As the founder of the Lincoln Highway Association, Fisher advocated the creation of a transcontinental roadway during an era in the automobile's infancy when long-distance travel almost always was by railroad. In addition to Indy, Richmond, Cambridge City and Terre Haute, Hoosier cities located on U.S. 40 include Greenfield, Knightstown, Plainfield and Brazil. In some towns, such as Plainfield and Greenfield, U.S. 40 is known by the local name of Main Street.